← Convert px3 to pxl and set page size via command line? Only three steps can make the conversion from ppt to ppm perfectly and easily. The tool application in the conversion is docPrint Document Converter Professional. You may have never heard of it before. Don’t worry, this article will give you a guide about it specifically. docPrint Document Converter Professional can also be called as docPrint Pro for short. It works with GUI application, command line application and virtual printer application. They are designed for different purposes. For example, the GUI application is good at batch conversion, the command line is used by software developers often, the virtual printer can also act as a document converter. But the functions they can realize are more or less the same. 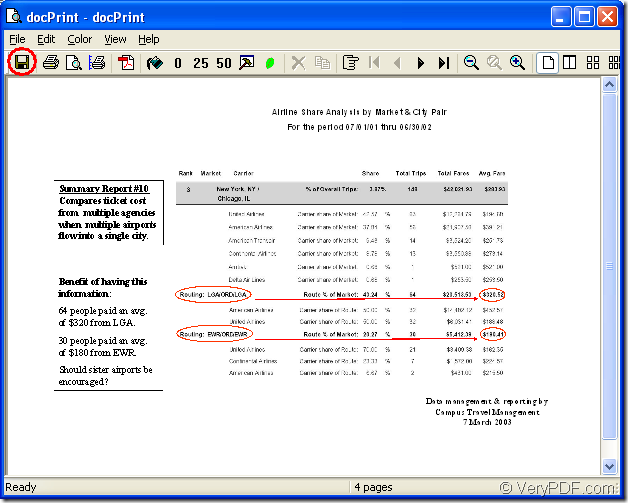 In the conversion from ppt to ppm, you can take the virtual printer docPrint as the helper. For using it, you should download docPrint Pro at http://www.verypdf.com/artprint/docprint_pro_setup.exe and install it on your computer. docPrint can be seen in printer list by clicking “Start”—“Printers and Faxes”. Please follow the steps below to convert ppt to ppm. You’d better download the application and try it yourself. If docPrint is not the default printer, please open the PPT document which needs to be converted and click “File”—“Print” to open “Print” dialog box in which you can choose “docPrint” as current printer and click “OK” button. You can also use the hot key “Ctrl”+ “P” on the keyboard to open “Print” dialog box. If docPrint is the default printer, please right click on the icon of PPT document and choose “Print” option to run docPrint directly. There is a new dialog box called “docPrint” will pop up in which you can see many function icons in the toolbar. Please see Figure1. You can not care about them if you want to convert ppt to ppm only. Three methods are offered in this step to open “Save As” dialog box. You can click “File” and choose “Save as” option in dropdown list. You can also use the “Save File” icon framed in the toolbar. The hot key “Ctrl”+ “S” is always a good method. The last step in the conversion from ppt to ppm is saving files in “Save As” dialog box showed in Figure2. Several operations are required. Firstly, you should choose a directory for the target files in “Save in” combo box. Secondly, in “File name” edit name, you should input the name of the target files. Thirdly, please specify the file format for the target files in “Save as type” combo box. Lastly, click “Save” button to save the changes and run the conversion. After that, a green progress bar will appear at the bottom of “docPrint” dialog box and it will be empty again when the conversion is completed. 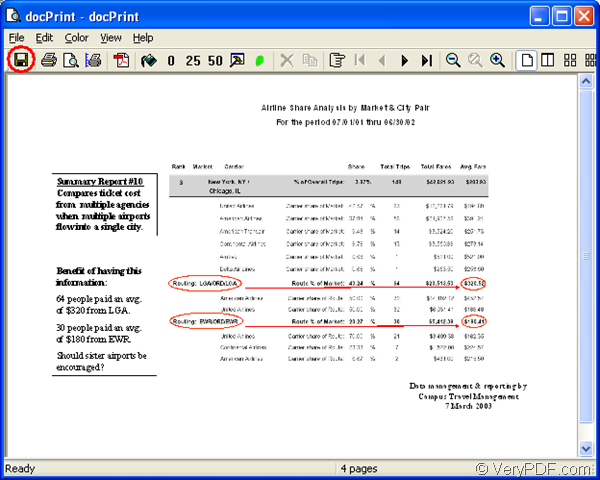 If you want to know more functions about docPrint Pro, you can see its user manual at http://www.verypdf.com/artprint/document-converter/help.htm or at its homepage http://www.verypdf.com/artprint/index.html. How to convert documents of HTML to MIFF? How to save toner when printing documents? How to use docPrint PDF Driver printer to convert PPT to PNG? This entry was posted in docPrint Pro and tagged docPrint Pro, ppt to ppm. Bookmark the permalink.